Are Google’s query-based social circles the answer to Facebook’s Graph Search? Imagine if Google Plus allowed you to perform searches such as, “People who take the same bus as me into the city,” or “People who like to eat at the Red Truck Bakery,” or “People attending the Dave Matthews Band Concert next Friday,” and creates in response a social network circle that other people might be invited to join, even temporarily, or who could join anonymously. Or Google Plus may dynamically create such a query-based social circle which it may recommend that you share through as you create a post about a music festival you’re going to, or a meal you’re reviewing from a local hotel. 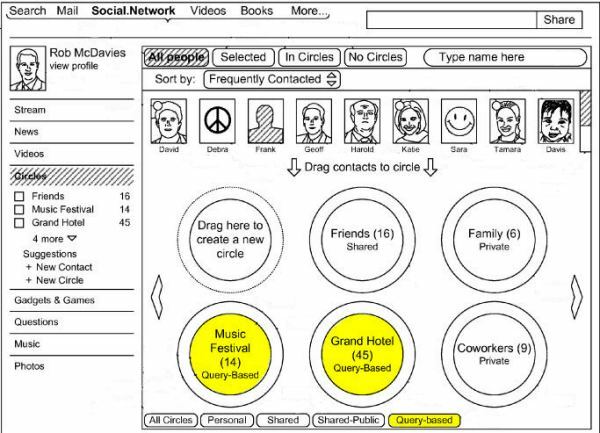 The image above from the patent filing shows a query-based circle for a “Music Festival” and a query-based circle for a “Grand Hotel,” as well as a button to only display query-based circles in the interface. This dynamic circle creation would enable you to identify and talk to people who share a common interest with you. Such a circle could be set up so that it would be open to anyone to join, or it would be a moderated circle that people would have to apply to join. It wouldn’t be limited to your “friends.” Considering most of the people I’m “connected” to through Google Plus or even Facebook are more likely from outside of my local area, this could be a good way for me to be social on a more local scale. A patent application published by Google in late December describes the use of queries to create social circles. The announcement of Facebook’s Graph search beta wasn’t announced until 3 weeks later in Mid-January, 2013. Transmitting social circle data corresponding to the query-based social circle to display a representation of the query-based social circle to at least one user of the plurality of users. People who might be added to such a query-based social circle would be determined by a relevance score for each of them that might be above a “threshold relevance score.” So unlike Facebook’s Graph search, a query-based social circle might be available to someone based upon whether or not the circle might be relevant to them, rather than whether they are a “friend” of the person searching. A query-based social circle could be temporary, or it could be longer term. It would enable people selected as members to be able to distribute information to each other. Location might be determined based on signals such as GPS location information, WiFi location information, or cell tower location information, or explicit locations indicated in a Profile or some similar manner. For example, you go to a coffee shop, or to a concert hall, and you check in to the social network, which can broadcast your location to your connections. Or that information might be collected from a status update or photos of a sign or a landmark. For events, contacts who are attending might be sent electronic invitations, or other sources of information could be used to determine who might be attending. A query can be dynamically generated based on real-time user input, such as a post to a social networking service. That writing of that post might lead to the creation of a query based circle. For example, someone makes a post to Google Plus, and they include the name of a local biking route that’s closing That might trigger the creation of a query-based social circle. The person making the post might be given a recommendation for distribution of their post to the social circle, and the people it’s distributed to might be anonymous to the person making the post. Someone regularly checks in to the social network, and writes and rates businesses of a particular type in a locale. A query-based social circle might be generated, and the person posting the reviews might be recommended to share them with others in the area who write reviews of local businesses of the same category. A query-based social circle might be offered to someone based upon a prediction that he or she would find it of interest. A person might not need to explicitly join a query-based social circle as a member, and could use it to distribute information to others. Someone could possibly use one of these social circles to anonymously distribute content, or could share information about themselves such as username, profile picture, and other profile information. They could also explicitly join the circle and share information about themselves with others. A query-based social circle approach could potentially connect a lot of people who might otherwise not communicate, and there seems to be a lot of potential in enabling people to connect through circles like this. Imagine for instance, a group that likes to go to the same park connecting through a dynamically created circle about the park, and using it to organize park cleanups, and celebrations of holidays at the park. These query-based social circles seem to have a potential advantage over Facebook’s Graph search in that they could connect people who don’t know each other but have common interests. For instance, you could join a circle of people who like to dine in the small town nearby, and actually learn about restaurants in the area, whereas with Facebook’s Graph Search, you would have to rely on other people you know from the area to get a response. This could potentially have a big impact on the distribution of reviews for local businesses by people interested in your local community (identified explicitly from their profile, or explicitly if they write about the area). We don’t know if query-based circles will be a feature added to Google Plus, but they could be. I could see query-based circles making Google Plus a much more useful and active place. This sentence – For instance, you could join a circle of people who like to dine in the small town nearby, and actually learn about restaurants in the area, whereas with Facebookâ€™s Graph Search, you would have to rely on other people you know from the area to get a response. So very true Bill Slawski because there are often scenarios when the people you know may not necessarily know about a certain shop or restaurant in the given area. Such kind of sharing will help discover people and information in a better way. At least on paper this looks a much more superior product than Facebook’s Graph Search. This patent fits nicely with the location features (https://support.google.com/plus/answer/2998354?p=plus_location&rd=1) on Google+. I think that Google is moving towards allowing people to communicate more gracefully with one another, especially those in need of products and services. A very powerful feature you could develop from this, is the real time location of a service you might require – for example you could find the current location of a plumber working or visiting in the next street – see their details and reviews and invite them over for a quotation etc. This would save professionals a significant amount of time and fuel etc – it could be easily monetized by Google through the AdWords platform. I am sure Google will come out with the best in market with Google circles (better than Facebook graphs). They are actually better at taking an idea(inspiration) from existing one and then innovate it to a much higher level. There is absolutely no doubt in my mind that the Google+ platform will innovate the social media world into being able to serve more relevant results than even Graph Search. The thing they’ll have to master is to really transform the platform into a highly user-friendly interface, where not only tech-savy are delighted to use but also cater to the average internet user. Will there ever be a point with social media that a consensus says is too far? Even if a person joined anonymously (or didnâ€™t join the circle at all), is it taking a step too far to search people who take the same bus or people who recently ate at a particular restaurant? Maybe Iâ€™m just sounding old fashioned. I enjoy Facebook and Twitter and Google+, but I think Iâ€™d draw the line here! So Google is not just standing around and doing nothing. I mean, Google is actually making its own social media platform. And even though it’s still far from what Facebook and Twitter has achieved, it’s still most likely to be a hit. Besides, its Google were talking about. One thing though, if this social circles is accessible to outsider’s (those who chose not to use any usernames or being anonymous), then each circle can have a vast amount of information. The question now is, thus Google sort out or filter all of these information to know if it’s reliable? I mean, anyone can take advantage on this because anyone can access or join the circle anonymously right? I do think that this is a big step both off us as searchers and users and both for Google as a social network. There are many websites addressing specific niches though that may now become obsolete as the information could be gathered and expert groups could be formed by the all knowing Google alone sigh n Real need f user recognition of some specific website. Google certainly are very good at innovating the already existing products in the market. Creating a easy to use interface and providing invaluable data for its users with search is where Google is very good at and I am pretty sure that this product for Google Plus will be far better than Facebook’s graph search. I can’t see facebook overtaking google when it comes to people searching. People dont even search for things, they google them. Google already has far to firmer grip on this no matter what facebook can come up with. I can’t help thinking that facebook has almost had its day with more and more people getting bored with it. It may have a billion users but surely 50% of those are people with a couple of accounts. Will this be like betamax vs vhs? If anyone is going to succeed with these more advanced searches it will be google. You got a very interesting article here. I am really sure that Google will come out with the best in market with Google circles, I believe better than Facebook. As always Bill, all your articles are very interesting. I hope to read more of your post.